Measuring patient satisfaction can be incredibly useful in improving your clinic’s success. 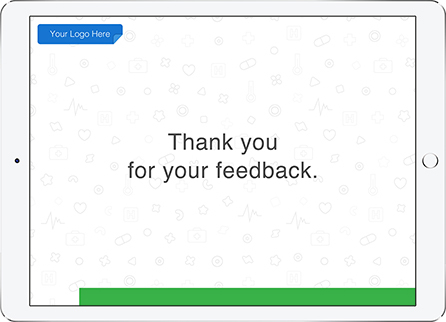 While it may seem like your patients leave happy, collecting feedback will help you understand how your patients truly feel about their experience at your practice. 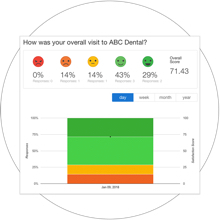 Are you looking for an efficient and insightful way to gather patient feedback for your practice? Collecting patient feedback will allow you to collect insights about their experience. Do you know what your patients really think about wait times or booking appointments? Understanding sore spots will help you build and retain a loyal patient group. 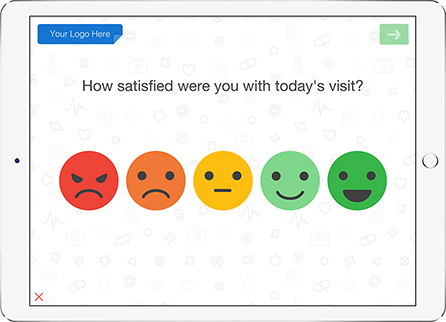 Anyone who has a practice that sees patients on a regular basis could benefit from this patient satisfaction survey template. Questions about your facility and the quality of care will help gauge how satisfied your customers are. 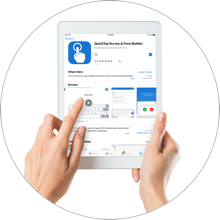 Using QuickTapSurvey also has a lot of benefits. Using a tablet in kiosk mode eliminates the need for an employee to reset the survey. Once completed, the survey will simply store the data and flip back to the start screen for the next person. Likewise, QuickTapSurvey works offline so no network connection is needed to capture data. 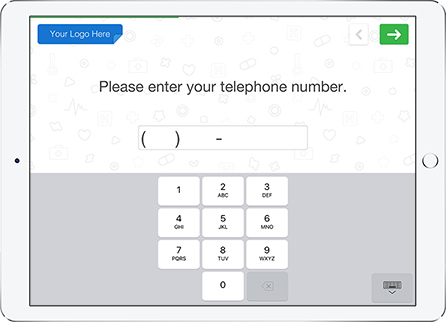 These are just a few benefits that can be realized from using QuickTapSurvey in a clinic. 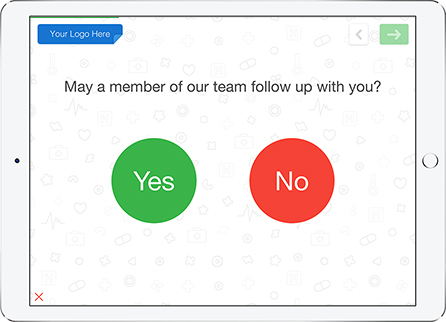 Customize the logo, background image, colors, and fonts to create your own beautiful patient satisfaction survey. 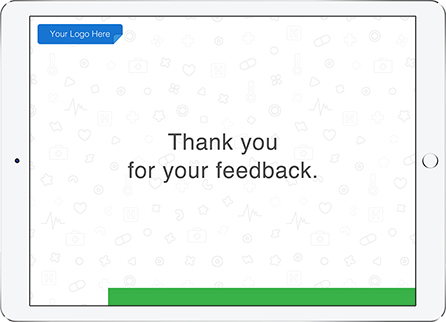 Start with this patient feedback survey template or build your own in minutes. Online reviews can make or break a business. More often than not, patients will check online reviews before making a buying decision. 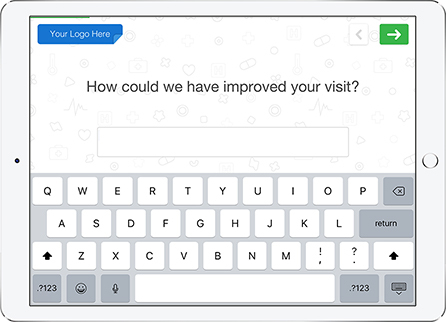 Collecting patient feedback allows you to ask happy patients to review you online, and gives you time to reconcile any issues with unhappy customers before they give you a negative review. Insights are the first step to delivering the highest quality of care to your patients. Feedback is not a one-time thing. It will help you make continuous improvements. Acting on patient feedback will improve the quality of your clinic overall and result in more satisfied patients. 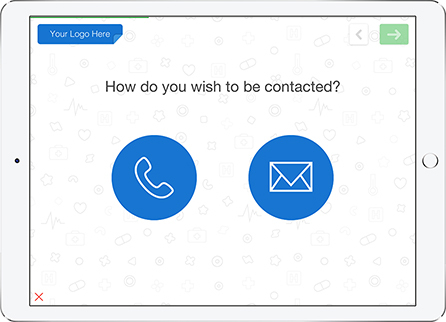 Sign up online and create your first patient satisfaction survey using our survey builder. 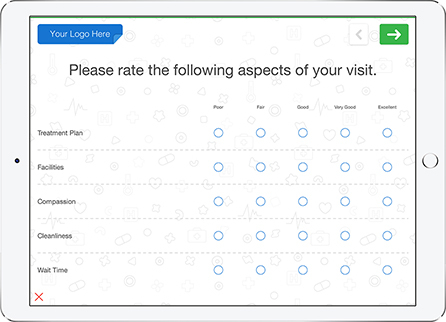 You can get started with this patient satisfaction survey template or create your own survey in minutes. 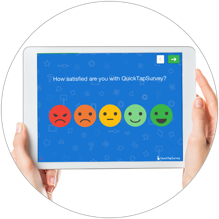 Get the QuickTapSurvey app on your tablet and open the patient satisfaction survey you created to start collecting feedback right away. Collect patient feedback in person or unattended with a kiosk. Review the data you’ve collected and generate a number of reports from our analytics and reporting dashboard. Take advantage of our reporting and analytics tools. 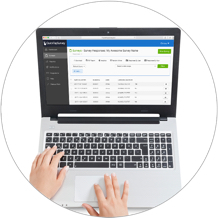 With QuickTapSurvey you can gain insights into your data by using our reporting and analytics tools. You can also generate a variety of useful reports.